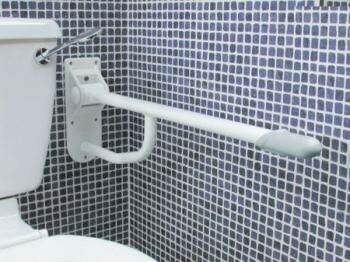 A high quality, steel grab rail with several innovative features. Drop Down Rail...A high quality, steel grab rail with several innovative features. The main rail is manufactured from oval section tube, making it comfortable to grasp and giving a broad area for support. The secondary under-slung arm combines with the main rail to give ultimate strength. Folding against the wall when not in use, the rail is held in the upright position with positive location. Maximum User Weight: 191/2 Stone (125kg).NOTE: The maximum user weight/load given for these products is dependent upon the correct choice of fixings for the mounting surface. We recommend installation by a qualified tradesman to ensure that the correct fixings are used. Length of rail 700mm (271/2"). Mounting bracket 260 x 100mm (101/4 x 4"). Distance from wall when upright 145mm (73/4").